FFinally, there’s a nutritionally complete food for cockatiels packed with the tastes and textures these popular pet birds crave. 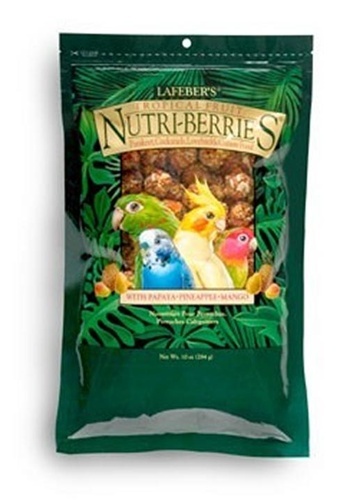 Tropical Fruit Nutri-Berries for Cockatiels combine whole seeds, grains, and 26% pellets with pieces of real pineapple, papaya, and mango together in berry-shaped pieces sized right for cockatiels, as well as quaker parrots, Indian ring-necks, lovebirds, and others. 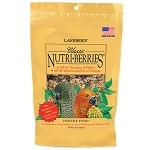 Tropical Fruit Nutri-Berries are a nutritionally complete food, just like pellets. However, instead of grinding down the ingredients and re-forming them into a pellet, we leave our ingredients mostly intact. 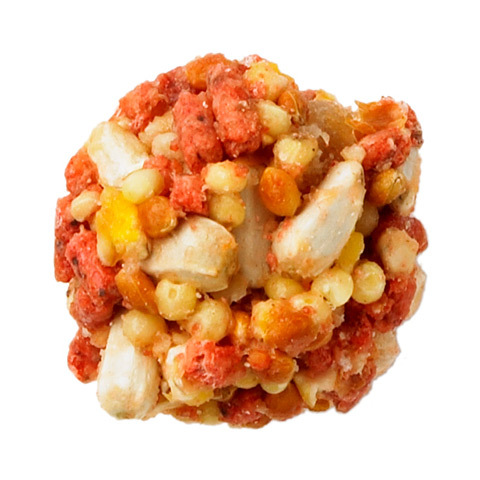 We hull our seeds and grains, add real pieces of fruit and coat each berrie with essential vitamins and minerals so your bird receives balanced nutrition in every bite he takes. A seed mix might be vitamin- and mineral-fortified, but these health benefits are lost as soon as the bird cracks the seed and the empty seed hulls are left in the food bowl. 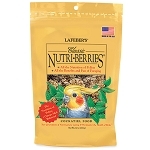 Tropical Fruit Nutri-Berries are a great way to wean your cockatiel off of a mostly seed diet and its associated nutritional deficiencies. 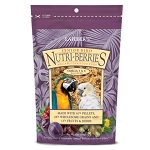 Tropical Fruit Nutri-Berries are also Omega 3 & 6 Balanced to give your cockatiel healthier skin and feathers and a more efficient immune system. Ingredients: Cracked Corn, Hulled White Proso Millet, Safflower, Malto-Dextrin, Red Millet, Pineapple, Papaya, Mango, Peanut Hearts, Corn Syrup, Canola Oil, Glycerine, Propylene Glycol, Wheat, Gelatin, Whole Egg, Hulled Oats, Soybean Meal, Corn Gluten Meal, Dicalcium Phosphate, Ground Limestone, DL-Methionine (an essential Amino Acid), L-lysine (an Amino Acid), Calcium Proprionate (a preservative), Vitamin A Supplement, Vitamin D3 Supplement, Vitamin E Supplement, Citric Acid, Mixed Tocopherols (a preservative), Menadione Sodium Bisulfite Complex, Thiamine Mononitrate, Pyridoxine Hydrochloride, Natural and Artificial Colors, V (source of vitamin K activity), Thiamine MOnonitrate, Pyridoxine Hydrochloride, Natural and Artificial Colors, Vitamin B12 Supplement, Folic Acid, Biotin, Ascorbic Acid, and Sodium Selenite. 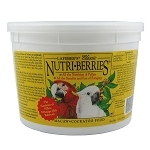 Tropical Fruit Nutri-Berries, Parrot 10 oz.